Hello champion. You commented that your arrival in Australia isbetter than ever dreamed. Moreover, it seems that this year the draw is in your favor and only have the hurdle of Federer in the semifinals. Do you see yourself champion in two weeks? Good luck. Hello Martina, nice to meet you. I arrived very well in Melbourne and last week I was training very well. I imagine that you have read in the press what happened to me so we'll see how it goes. As I always see in the next round with a player to face. On Wednesday against Tommy Haas. Good, Rafa. With the resignations of yourself and David Ferrer to play the Davis Cup in 2012. Who do you think will be the representatives of Spain against Kazakhstan? I was in the final in Seville and I would like for you to come back to play this competition. Here in Melbourne is Alex Corretja who is doing a great job and talking to the players. I like to play for Spain, my country, but as the calendar is structured and the Davis Cup schedule it is impossible to play everything. Also, this is an Olympic year which I also will be representing Spain and it makes the calendar is even more tighter. Do you think Djokovic can repeat this year as bright as the season last? Hopefully this year you're the one who wins it all. We do not know, the season has just begun. Hopefully not because ... I won almost everything! 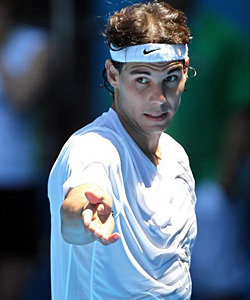 Hi Rafa, what do you think Ivan Lendl can bring into Andy Murray game? Is it possible to add things to a 24 year old, already formed? Good luck in Australia. I don't know Ivan Lendl coach so I cannot comment on something I don't know. Andy is a very talented player, a great player who has already achieved major titles and sure that he will win sooner or Grand Slam tournaments. Hello phenomenon, can you see a professional tennis players strike? Can you tell exactly what the players claims are? I think that it bothered you that Federer should be kept a little apart. I do not think that this is the place where should talk about these thing as well. Please understand it. If you were to choose a single title this year, would it be: Roland Garros, Wimbledon, the Olympics or the Tennis Masters Cup? I hope that you can win them all. All titles are clear and important I would like to win any of them. The Grand Slam in tennis are the most important titles in any case. Why the change of your racket? Isn't it too risky to do so just when you start the season and the first Grand Slam of the year? Luck champion. I have not changed my racket, just a few small adjustments to the weight of it. But we know that anything here is magnified (press). I don't take unnecessary risks and do not consider it being a risk. Hey genius. Who do you think will be the tennis player revelation of this year? Any young Spanish player will surprise us? We do not know, is a mystery. Javier Marti is playing pretty well. Hopefully a goal, using a tennis term. Abu Dhabi's exhibition is a perfect preparation before a Grand Slam. They play high-level games but without the pace and pressure of the competition. The problem is that the calendar does not allow large breaks or adequate preparation at the beginning of the season. But believe me that the problem is not the exhibition tournament play, it is more complicated! A football question: What do you think will happen in classic King's Cup? Will it happen your Mother? Can you see the two parties from Australia? Champion Cheer! I do not know the truth and I do not talk much about the subject as a hobby whenever I do see I think that Yes see Wednesday (Thursday morning already here in Melbourne) party. We have everything prepared.